Europe is pushing the competitiveness frontier in many ways, as illustrated by the latest edition of the Global Competitiveness Report, the World Economic Forum’s annual assessment of the drivers of productivity and prosperity in 138 countries. 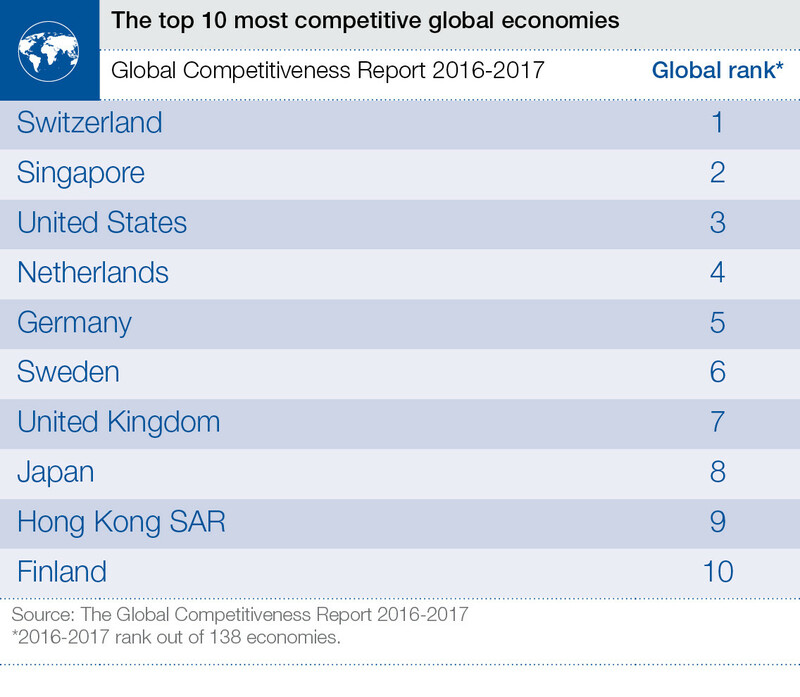 Indeed, the Europe region - which includes the EU28, Iceland, Norway, Switzerland, the Balkans, and Turkey - performs well above the global average in terms of competitiveness. This result is driven by the performance of several regional champions, most notably Switzerland, which leads the global rankings for the eighth consecutive year, as well as seven more European countries in the top 12: the Netherlands (4th), Germany (5th), Sweden (6th), the United Kingdom (7th), Finland (10th), Norway (11th), and Denmark (12th). Yet the consequences of the financial crisis have been so profound that despite these relatively good fundamentals, growth in the region has not recovered to this day, having averaged 1.99% in 2015 for the EU28, 0.85% for Switzerland and 3.84% for Turkey (compared respectively with 3.35%, 4.14% and 4.67% in 2007). Perhaps more worrying is the fact that a perceived declining openness in the trade of goods and services, one of the historic mainstays of Europe's traditionally strong competitiveness, appears to be putting these fundamentals at risk. With a proven link existing between openness and innovation, the imperative for Europe's competitiveness and future prosperity must be to reverse the current trade of encroaching rules and regulations that is hampering trade, and to enhance the mobility of talent and ideas so that it can drive more inclusive growth and continue to thrive in the knowledge economy of the Fourth Industrial Revolution. This is especially true for the set of countries in the bottom half of the regional league table, as the range of scores for all components of the GCI is wide (see the chart below). 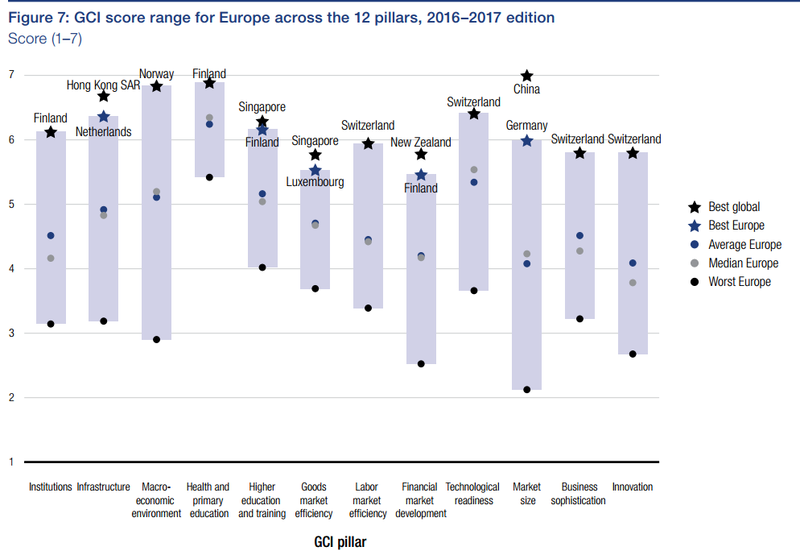 Worryingly, the most crucial component for European competitiveness – innovation – receives the lowest median score and the gap between the leading and lagging countries is particularly pronounced. 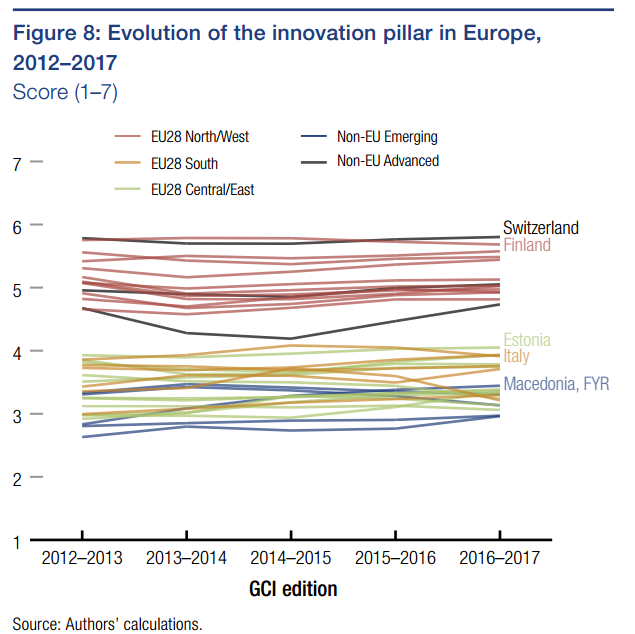 The next chart shows that the region’s countries are clearly divided in terms of their innovation performance, with a significant gap between the assessment for Northern and Western European countries versus Central, Eastern, and Southern European ones. There are some recent encouraging signs of convergence in certain dimensions, but if the region turns more inward-looking, then it could damage efforts that have been made to remedy this situation. The final chart zooms in on seven important human capital indicators. Among the basic education indicators, the regional gaps are most apparent for math and science education. 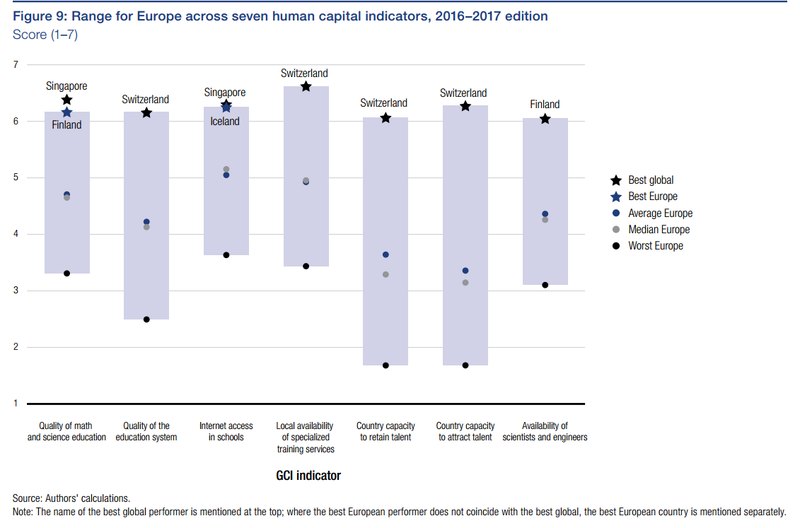 On attracting and retaining international talent, although one European country (Switzerland) achieves the top global scores, the average for the region as a whole is low; this does not bode well for the creation of a vibrant European knowledge economy. The United Kingdom is currently still the most attractive EU destination for talent, yet the Brexit vote has created significant uncertainty over the conditions under which workers from EU countries will be able to participate in the UK economy in the future. Moreover, university applications from the European Union look set to drop amid uncertainty over prospective students’ status and subsequent access to the UK job market (see the report on the potential implications of Brexit; note that data presented in the report were collected before the Brexit vote). Other European destinations also seem to be losing appeal. Indeed, some of the largest score drops for France compared to last year were registered for the “attract and retain talent” indicators. Accelerating innovation efforts will be crucial to maintaining current levels of prosperity, and Europe can expect high returns from focusing its resources on nurturing its talent.